It’s only a few days before Christmas. The malls are slammed, parking lots overflowing. We kept being surprised at the line ups at all the stores. We didn’t remember dealing with this in years past. That’s when it hit us – we haven’t been home for Christmas in TEN YEARS! Christmas 1999 saw us headed to Club Med Playa Blanca for the Millennium! (Seems like yesterday! How was that TEN YEARS AGO???) We had a great time and we’ve sorry they’ve closed that location. Club Med is camp for adults – great for kicking back, relaxing, eating WAY too much French pastry and generally being pampered! French pastries and Mexican winter sun – does life get any better? On the way to Club Med Kani, Maldives. Christmas 2000 we were living in France. That put the Maldives within MUCH easier reach! It was still a 12 hour flight from Zurich, but nothing like the 35 hours + it would have taken us from California! From the plane, looking out at all the low-lying atolls that make up the Maldives you can truly appreciate their grave concern over global warming! Once again Club Med Kani pampered us silly, and we returned well rested and happily relaxed after two weeks of fun in the sun. Christmas 2001 we headed to The Big Easy for New Year’s Eve. New Orleans was a blast, but first we stopped in Chiricahua National Monument which was open on the 25th! The park was empty and it was a serenely beautiful place to spend the day hiking and photographing the odd rock formations that fill the park. We also took in White Sands New Mexico – where it’s always a white Christmas! They even rent sleds for when you’re done making "sand angels"! Scarlet macaws, Corcovado National Park, Costa Rica. Christmas 2002 we flew to Costa Rica for 2 weeks of sun, beaches, hiking, and more! We hiked down deserted beaches while scarlet macaws fly nosily overhead. We saw toucans, sloths and exotic orchids in the rainforest and listened to the howler monkeys scream at us from the trees while we drank tropical fruit juices. We saw leatherback turtles lay their eggs and watched a volcano erupt – from the hot tub! Life was good! In 2003 we spent Christmas in Tunisia. Ever seen Star Wars? Well, we grew up on it and had a blast having a drink at the Mos Eisley Cantina and visiting the real Tataouine. There were also spectacular Roman ruins to explore and the fabulous Bardo Museum with an amazing collection of Roman mosaics. The highlight of the trip? 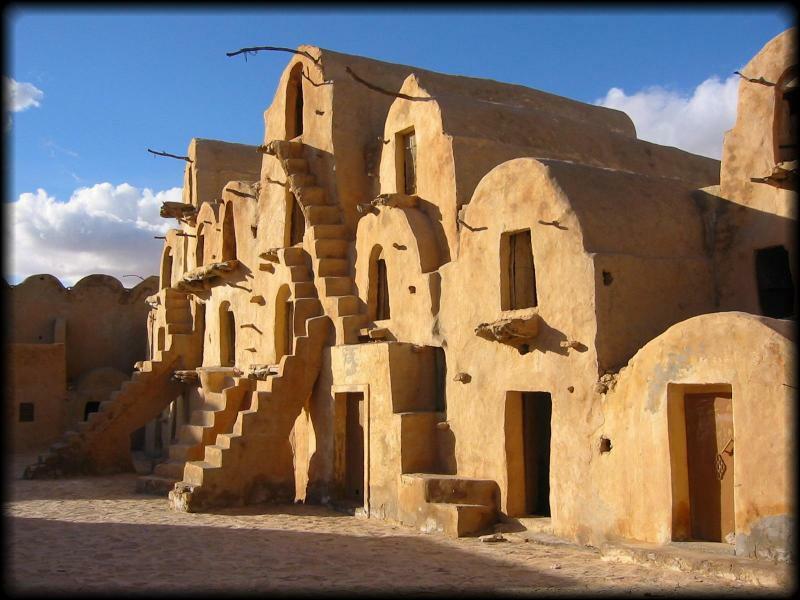 Just outside Tatooine is Ksar Ouled Sultane. The old ghorfa’s (granaries) rise four stories up. 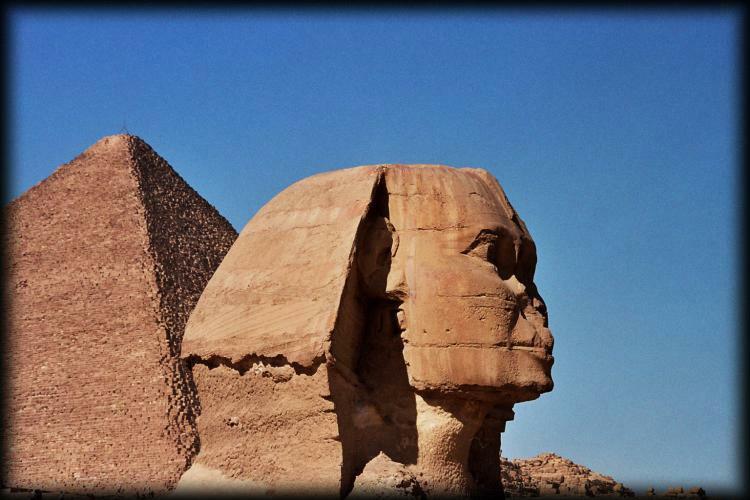 The Sphinx watches over Egypt as she has for almost 5,000 years. 2004 saw us exploring even older ruins in Egypt. From the Sphinx to the Nile to the Temple at Karnak, Abu Simbel and of course, the Pyramids, the sights of Egypt are incomparable. No where else have we felt such an amazing sense of history. Seeing tigers on elephant back, Kanha National Park, India. For Christmas 2005 we headed to India. The crowds and hassle of India made it difficult for us to truly enjoy ourselves (although everyone tells us the south is different – some day we’ll have to find out for ourselves). However, the Taj Mahal is truly the most beautiful building we’ve ever seen – in 51 countries! It’s also hard to beat a day where you get to see tigers on elephant back! What better way to spend Christmas than to head to the home of frankincense? That’s what we did in 2006. In Oman you’ll also find plenty of gold and myrrh for sale. We didn’t meet the three wise men, but we did get to see the amazingly beautiful Wadi Shab, run up and down the dunes in the Wahiba Sands and check out castles in Nizwa and the fabulous Sultan Qaboos Grand Mosque in Muscat. We also headed next door to the UAE to visit Sharjah, Abu Dhabi and the incomparable Dubai where we enjoyed a white Christmas at Ski Dubai! In 2007 we decided to be truly decadent and went island hopping in the Caribbean! St. Lucia, Martinique, Dominica, Anguilla, St. Martin and Sint Maarten later we had soaked up lots of sun, taken plenty of walks on soft white sand beaches, gone swimming in “Champagne” and watched beautiful sunsets over the ocean. Swimming with sea turtles off Maui, Hawaii. 2008 we went all out. We ignored the budget and splashed out in Hawaii – on our last big trip with just the two of us! We spent a week each in Maui and Kauai. We stayed at the Sheraton in Maui and had a fabulous time whale watching and swimming with turtles! We drove the road to Hana and up Haleakala too! Then we headed over to Kauai for some more fun in the sun at Poipu Beach. We’ve always gone away when Wendy, as a teacher, could. Now that she’s home with our daughter we have more flexibility when it comes to planning our trips. So, much as it feels weird not to be packing our bags, we’re happy not to have to deal with airports bursting with holiday travelers!